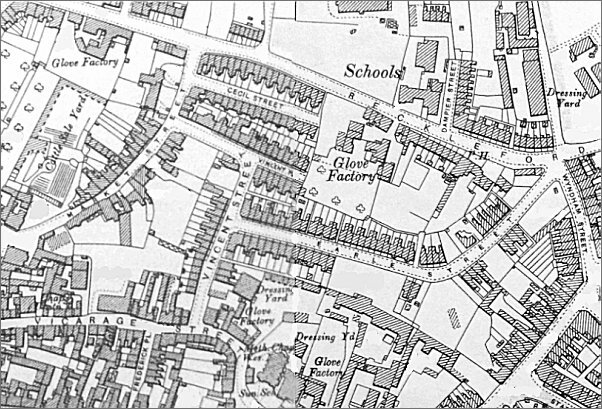 Earle Street was built by William Tucker in the 1890s on orchard land lying between Reckleford and Vicarage Street, as shown on the maps below, and once owned by yeoman Samuel Isaac. Earle Street ran from the junction of Reckleford and Wyndham Street in a southwesterly direction before turning 60° to run west as far as Vincent Street, built at the same time. In 1913 Central Road was constructed, running from the bend in Earle Street to Middle Street. 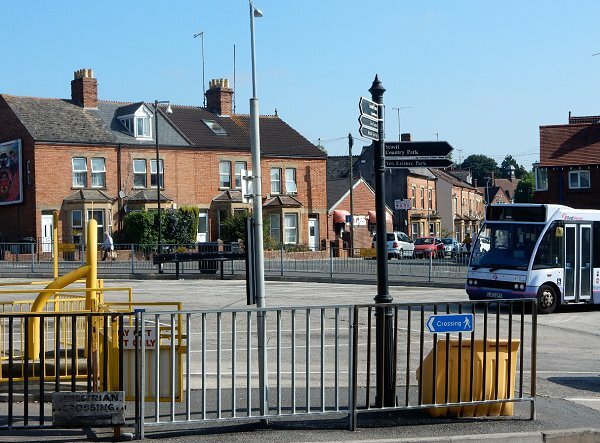 When William began investing in town development and providing speculative housing for glove workers, he named two of the roads he built after members of his family; Earle Street after his son and later three-time Mayor of Yeovil William Earle Tucker. He named Vincent Street, as well as Vincent Place, after his wife's maiden name. 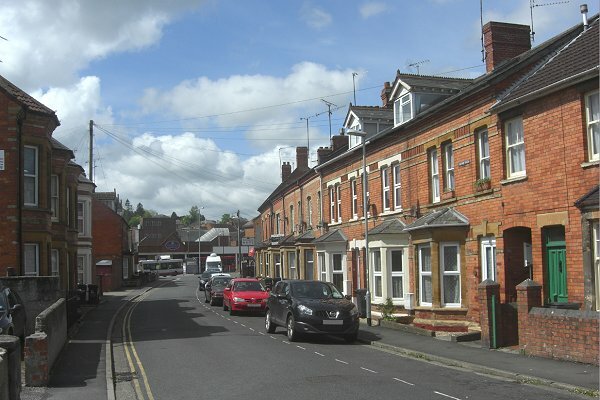 The rest of the development were Cecil Street and Salisbury Terrace in Reckleford - both named after the Prime Minister of the time, Lord Salisbury, whose family name was Cecil. Many thanks to Tony Fearn for the following - "My dad worked for Pearce's sweet manufacturers (he made the boiled sweets). in the 1950s they were on the corner at the top of Earle Street. I was 8 or 10 years old, so that would make it around 1955 /56, when around 7am on a Sunday a policeman turned up at our house in Alastair Drive. He said there had been an explosion at the banana ripening plant of the fruit firm, caused by the gases used to ripen the bananas and all the windows in Earle Street had been blown out. I remember the green doors of the firm were hanging in splinters, like a bomb had gone off. 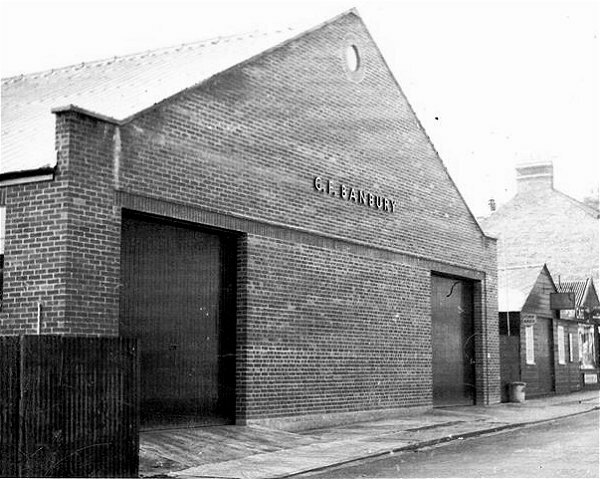 The unit was about 2/3rds down Earle Street, about where the steps to the car park are now, it was run by Banbury's. Pearce's were also a supplier of chocolates etc. such as Mars bars to shops. as well as making boiled sweets. The Mars bars were a dozen per box and each box was one of a dozen in a large cardboard box, so we unpacked the large cardboard boxes (about 3 foot square) and these were given to each house to board up their windows as the glaziers did not have enough glass to repair them for a few days. I seem to remember they had to get glass from all over the West for days after the event. I was sent up to the 3rd floor to unpack the boxes of Mars, Milky Way, etc., then stack the boxes of chocs in a pile and throw the outer cardboard boxes out of the door into the street for the people to take. We were there until well after lunch time, we then walked back home to Alistair Drive and had our reheated lunch in the late afternoon. My father was Bill Fearn and he was the 'sugar boiler' and made the boiled sweets for Pearce's. He made many recipe's - his was the Somerset Herbal Tablets, Pearce's Perfect Peppermints and many more. In my school holidays I would stay with him and hand wind the machine that moulded the sweets from a long sausage of hot mix." Does anyone else remember the explosion? Please contact me if you do. The following report is from the Dundee Courier and Advertiser of 12 December 1954 (many thanks to Rob Baker for finding it). 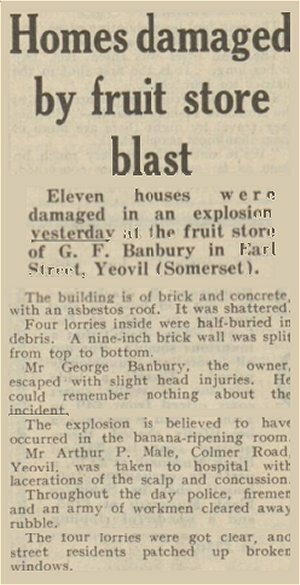 Eleven houses were damaged in an explosion yesterday at the fruit store of GF Banbury in Earl Street, Yeovil (Somerset). The building is of brick and concrete, with an asbestos roof. It was shattered. Four lorries inside were half-buried in debris. A nine-inch brick wall was split from top to bottom. Mr George Banbury, the owner, escaped with slight head injuries. He could remember nothing about the incident. The explosion is believed to have occurred in the banana-ripening room. Mr Arthur P Male, Colmer Road, Yeovil, was taken to hospital with lacerations of the scalp and concussion. Throughout the day police, firemen and an army of workmen cleared away rubble. The four lorries were got clear, and street residents patched up broken windows. 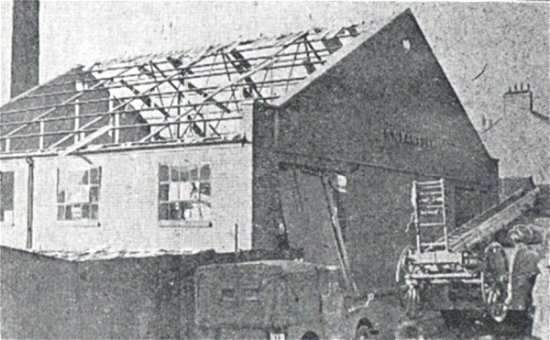 Photograph from a newspaper showing the damage to Banbury's fruit warehouse. 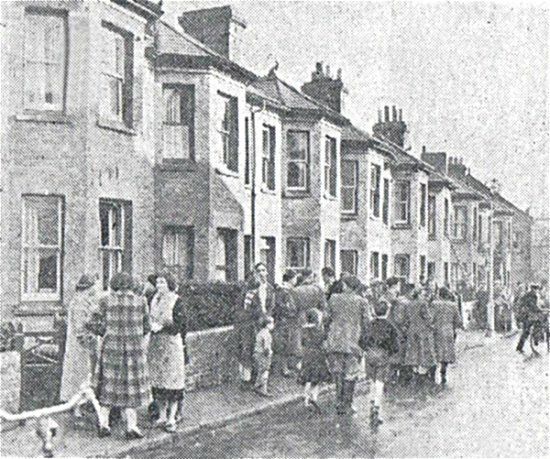 Another photograph from a newspaper showing residents of Earle Street outside some of the houses, that received slight damage, opposite the warehouse. As reported in the 13 December 1954 edition of the Dundee Courier. 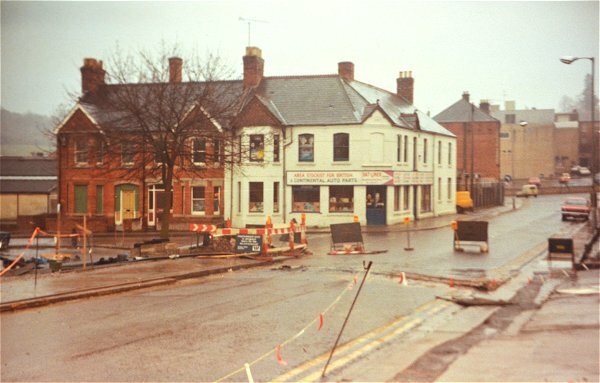 The western arm of Earle Street was demolished in the 1970s and 1980s for the development of the bus station and the Quedam project. Only the eastern part remains today. An aerial photograph of 1958 shows the full length of Earle Street running across the centre of the photograph from Vincent Street at left to Reckleford at top right. Central Road joins from bottom right. 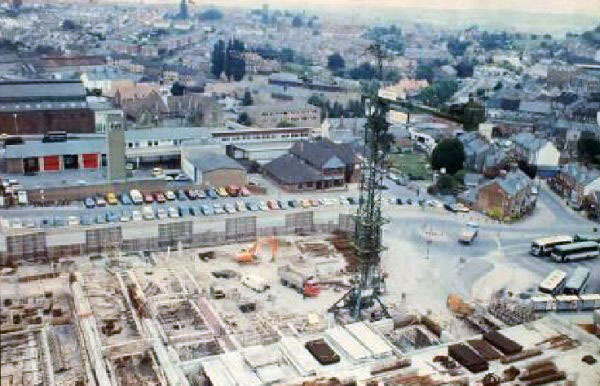 In 1983 Roger Key was one of the tower crane operators and took this photograph from his crane, the bus station is at lower right with the remains of Earle Street at centre right. The Labour Club is at centre with the ambulance station behind it and the fire station to its left. A 1960's view of Earle Street from its junction with Vincent Street. At the far end the small building that looks like a chapel was the hall of the Independent Order of Odd Fellows and is now Ron Darch's 'By the Fire' shop. 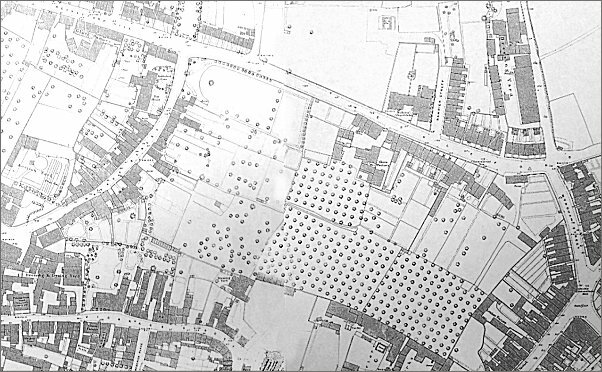 The house to its immediate right survived and today is opposite the bus station, otherwise all the houses in this photograph were demolished. 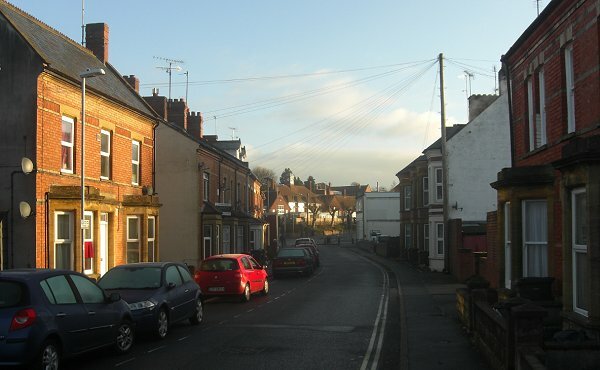 The stretch of Earle Street remaining today starts at the far end of this photograph and runs off to the left. Looking north along Vincent Street photographed in the 1960s. At right is the junction of Earle Street with the 'Vincent and Earle Street Stores' on the corner. 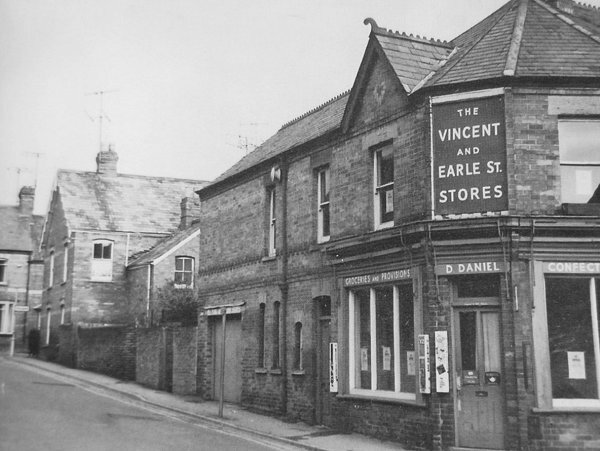 The Vincent and Earle Street Stores, with Earle Street off to the right. Photographed in the 1960s. 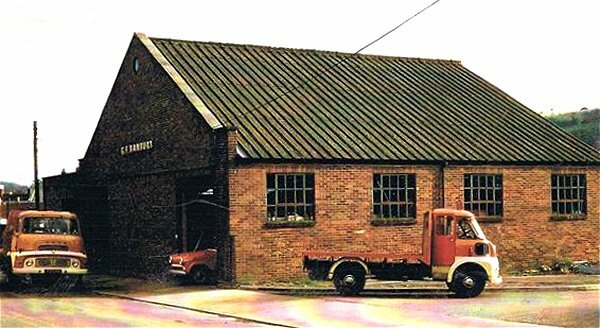 Banbury's Earle Street premises - probably photographed in the 1960s. 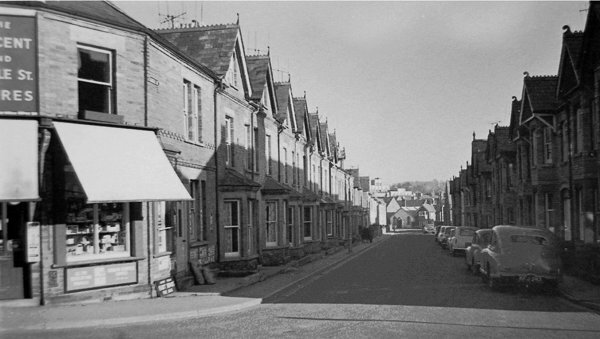 Banbury's Earle Street premises photographed in the 1970s. Looking south along Vincent Street towards Vicarage Street in 1983. Earle Street comes in from the left although the Vincent and Earle Street Stores has now been demolished. 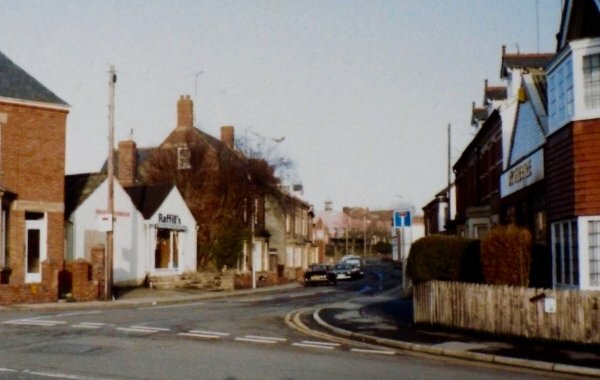 Earle Street photographed in the 1980s. Raffill's Italian restaurant, at left had a re-fit and became the Sugar Cane Chinese restaurant, which it remains today. 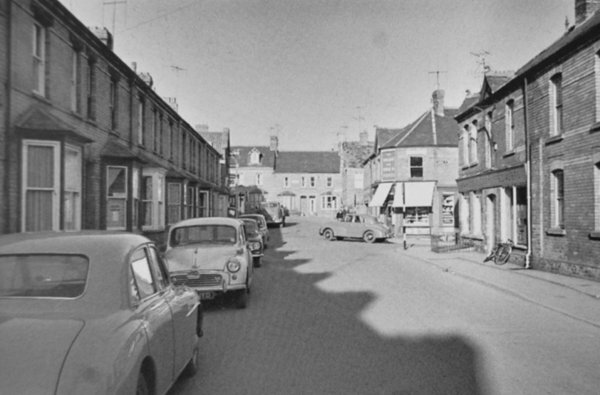 The building towards far right was the Oddfellows' Hall, but has been 'By The Fire' since the time of this photo. The surviving part of Earle Street today, looking towards the bus station. Photographed 2013. .... and looking back towards Reckleford. Photographed in 2014. Earle Street seen from the bus station. Photographed in 2016.